Irvingdog wrote: Looks like Oops has this one right. 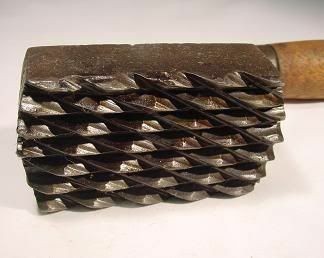 Sure looks like a checkering tool to me. i don't know about that. i've got checkering tools and they are TINY. judging from the size of the handle, this tool looks to be quite large. like maybe a couple inches across. the tool in question looks as though it was designed to be heated. i'm thinking it might be used to burn the pattern into, say, leather. something like a burned in "Sam Brown" pattern. It finally dawned on me where I've seen that pattern before. It's a thread chasing tool for removing burrs and trash from threaded parts. But those would be some BIG threads. Vibe wrote: It finally dawned on me where I've seen that pattern before. It's a thread chasing tool for removing burrs and trash from threaded parts. But those would be some BIG threads. Luke "Whats in (out) there?" 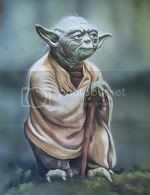 Yoda "Only what you take with you." yes that would be it. sorry i wasnt sure about the spelling. (thats the one thing i was never any good at in school) and the spell check on my computer told me to spell it the way i did. thanks! OK. It's a grill cleaning tool.